Late last August, as a critical contest between two massive YouTube channels came into focus, a Canadian creator duo sensed an opportunity. After seeing a number of videos about the contest proliferating across YouTube (and before people starting hacking printers, buying billboard in Time Square, and undergoing a number of increasingly elaborate shenanigans), the two 16-year-olds behind FlareTV (who declined to reveal their names, but did say they’re based in Vancouver, British Columbia) became one of the first channels to launch a live stream tracking Kjellberg and T-Series’ dueling subscriber counts in real time. In addition to (correctly) presuming thousands of fans would be searching for a place to follow the feud, FlareTV also sought to create “a center for viewers to interact with each other and discuss the contest in one place,” they told Tubefilter. This isn’t the first time that a creator has keenly sought to stream subscriber counts to the delight of seven-figure-plus view counts. A similar venture by drama YouTuber John Kuckian tracked the fallout from the YouTube beauty community controversy last fall. Instead of watching rising subscriber numbers, the appeal in tuning in was the schadenfreude in seeing them fall. But the net result was the same. Kuckian’s videos amassed millions of views with virtually no overhead or production effort. 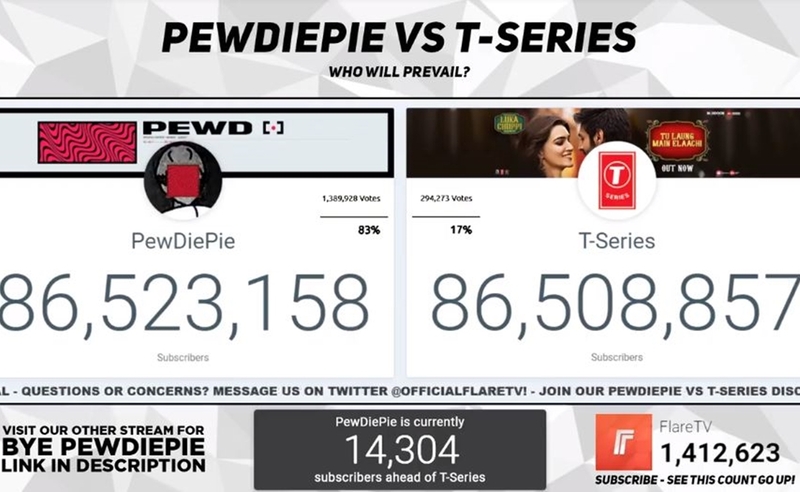 There are other channels tracking the subscriber race between PewDiePie and T-Series. At least eight showed up on the first scrolls of search results on YouTube at the time of posting this story. But FlareTV is on top. Maybe it was the channel’s first-mover advantage, or maybe just some ‘je ne sais quoi’ with the YouTube algorithm. Whatever the reasoning, it’s caused the duo’s channel numbers to go up and to the right at an almost incredulous rate. FlareTV’s top-ranked search result — and the fact that Kjellberg has managed to prolong his lead over T-Series far beyond initial guesstimates — has done wonders for the burgeoning channel’s growth. At the end of August 2018, before the stream launch, the channel counted just 6,600 subscribers. Now, it counts over 1.4 million. The channel’s viewership has also skyrocketed from 172,000 views to 173 million lifetime views over the same time period. 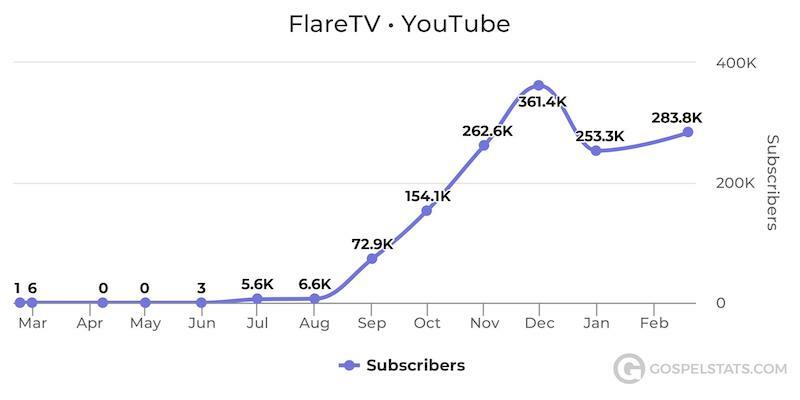 A look at FlareTV’s monthly subscriber additions over the past 12 months. Take a guess when they first launched their PewDiePie vs. T-Series live stream. In addition to being one of the first such streams to track the Kjellberg and T-Series contest, the stream has been a moneymaker for FlareTV, which has subsequently released merch inspired by the competition. That’s not to mention revenues from ads and Super Chats clocked during the half-year-old undertaking and general AdSense revenue from the video, which Flare says has been viewed a total of 200 million times — with peak concurrent viewership of roughly 74,000 and an average view duration of more than 4 minutes. Check out our interview with FlareTV’s purveyors, in which they discuss how the channel came to be and how the stream has supercharged their online presence and what’s next. 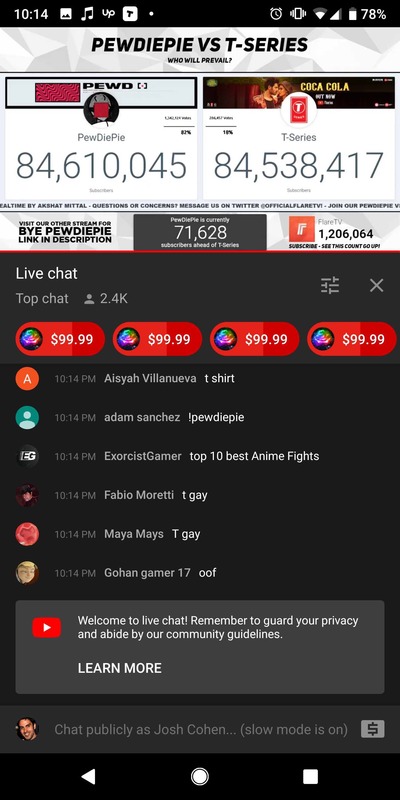 This screenshot of FlareTV’s video from January 2019 shows how it’s not doing too shabby on the Super Chat revenue. Also, the “conversation” the duo behind FlareTV wanted obviously isn’t happening – at least not all the time. As we all know, internet comment sections can be terrible. FlareTV: FlareTV was started in January of 2018 by two 16-year-old entrepreneurs residing in Canada. Although the channel has grown exponentially since them, we remain the only ones who create content on the channel and have access to it. Our goal was to entertain and inform viewers about relevant topics happening on social media — mainly YouTube. As of today, our business is based on YouTube, with a clothing line based on the channel. FTV: The FlareTV channel actually started out as a live, music streaming channel. Although we currently have other live streams that are receiving more publicity than our original music live stream, music remains active on our channel. All of the music is obtained from NoCopyrightSounds and Frequency, both of which provide copyright-free music for content creators. Copyright-free music is essential, as it enables creators to monetize their videos and live streams. Other than live streams, we also produce original videos to inform viewers about topics related to social media and the internet. Tubefilter: Why did you decide to start streaming the contest between PewDiePie and T-Series? FTV: Near the end of the month of August, we noticed that PewDiePie — the most subscribed YouTuber of all time — was facing competition from Indian production firm T-Series. After seeing many traditional videos appear in quick succession about the topic on YouTube, we decided to start the live stream as a center for viewers to interact with each other and discuss the contest in one place. Tubefilter: Why do you think your stream has risen to the top? FTV: We think our live stream has attracted so many viewers because it was the first of its kind. Since we launched so early, it appeared in search results whenever people were searching for terms related to the topic. Tubefilter: What kind of ad revenues has the venture yielded? FTV: Unfortunately, we are unable to provide this information. However, a rough estimate can be calculated based on YouTube’s average CPM in different countries. Our most popular audience views the content from the United States, India, and the United Kingdom. In addition to the live stream, we started selling merch alongside Streamlabs. We currently use the PewDiePie vs. T-Series live stream to generate sales, including mugs, T-shirts, and hoodies with our logo on them, as well as T-shirts indicating whether fans are supporting PewDiePie or T-Series. When and if PewDiePie is ultimately defeated, we have not decided what future business ventures we will pursue, but we hope to expand our channel with more content about socially-relevant subjects. Tubefilter: You blew past 1 million subscribers and keep climbing. What are you going to do with your newfound success? FTV: One million is a great achievement and our team is extremely happy that we have been able to influence the amount of people that we never would have thought possible. We are planning on uploading many more videos soon, videos such as ‘Top 5s’, as well as news, statistics, and other informative videos.